WAXMAN, Henry Arnold, a Representative from California; born in Los Angeles, Los Angeles County, Calif., September 12, 1939; attended Los Angeles public schools; B.A., University of California, Los Angeles, Calif., 1961; J.D., University of California, Los Angeles, Calif., 1964; lawyer, private practice; member of the California state assembly, 1969-1974; elected as a Democrat to the Ninety-fourth and to the nineteen succeeding Congresses (January 3, 1975-January 3, 2015); was not a candidate for reelection to the One Hundred Fourteenth Congress in 2014; chair, Committee on Oversight and Government Reform (One Hundred Tenth Congress); chair, Committee on Energy and Commerce (One Hundred Eleventh Congress). Papers: In the Nancy Harvey Steorts papers, 1937-2000, 215.8 cubic feet. Correspondents include Henry Waxman. Papers: In the Helen Albert papers, ca. 1985-1986, amount unknown. Correspondents include Henry Waxman. Papers: ca. 1971-2015, approximately 278 linear feet. The collection consists of materials related to the career of Congressman Henry A. Waxman. 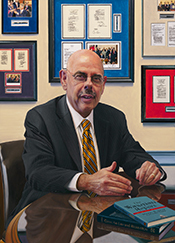 The bulk of the collection documents Waxman’s committee work while serving for the United States House of Representatives. Included are notes, research, printed copies of Congressional acts, correspondence, videos, and other records related to public and social issues such as the Clean Air Act and other environmental issues; health reform issues such as tobacco, Medicaid, nursing homes, and steroids; and other matters. Additionally included are press releases, personal calendars and a small number of awards. Some materials in the collection are restricted. Websites: ca. 2014, amount unknown. The only items accessible through Archive-It are websites from Congressman Henry Waxman's committees he chaired and his Congressional website: https://archive-it.org/collections/4949. Waxman, Henry A. "The Clean Air Act of 1990: An Overview of Its History and Policy." In Clean Air Law and Regulation, edited by Timothy A. Vanderver, Jr. Washington: Bureau of National Affairs Books, 1992. ___., with Joshua Green. The Waxman Report: How Congress Really Works. New York: Twelve Books, 2009.